With its structures dating back to 1832, The K Club represents true luxury that has been able to withstand the test of time. Located within the quaint county of Kildare, the resort is just a 30 minute distance away from the bustling capital city of Dublin, perfect for guests to enjoy their sightseeing journeys as they choose, with no limits. The property offers a wealth of dining outlets, featuring locally-sourced cuisine, international fare, afternoon tea service, and more for travelers' enjoyment. When guests are taking a break from exploring the resplendent countryside, The K Spa boasts a variety of expert treatments, including facials, wraps and massages, all while utilizing luxurious Irish products. For meetings and events, The K Club features six distinct venues, perfect for any variety of functions a group would like to partake in. When travelers are looking to explore, a location in Kildare is prime for those who delight in exquisite historical moments. Guests are just moments away from castles, charming communities, and the city of Dublin, which boasts a welcoming dining and nightlife scene, museums, and ancient castles. Onsite, The K Club features an array of activities within its 550-acre property, with many relating to the great outdoors, from swimming pools, to falconry displays, to fishing, and horseback riding, to name just a few options. A stay at The K Club, within either the elegant guestrooms or suites, affords endlesss luxuries during a stay in Ireland. 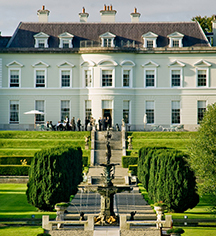 The K Club, a member of Historic Hotels Worldwide since 2015, dates back to 1832. Airport Transportation: An airport shuttle may be arranged through the hotel's concierge, EUR 90 each way for up to two people. Cancellation Policy: Cancellations at least 24 hours prior to arrival. Transportation: Limo/town car service available; rates apply. With its structures dating back to 1832, The K Club represents true luxury that has been able to withstand the test of time. Located within the quaint county of Kildare, the resort is just a 30 minute distance away from the bustling capital city of Dublin, perfect for guests to enjoy their sightseeing journeys as they choose, with no limits. 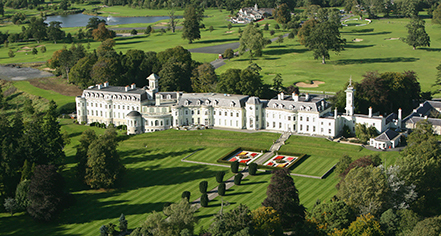 Learn more about the History of The K Club .